On the lookout for a gorgeous hilly retreat that glows with amazing natural beauty and charming sights? Well then, your answer will be Panchgani in Maharashtra. Panchgani in translation means five hills which means you have breathtakingly scenic places to visit. The majestic mountains create a beautiful background on one side and the coastal plains form the other. The hilly retreat is known for its unpolluted environment and it is said that the oxygen content in the atmosphere here is higher in comparison to other regions. Owing to this factor, the place attracts a large number of people, who come here to breathe in some fresh air and enjoy the relaxing atmosphere. By Air: The nearest airport is the Pune Airport which is located at a distance of 111 km from here. The airport is well connected to all the major cities across the country such as Delhi, Bengaluru, Chennai, Hyderabad etc. By Train: Satara is the nearest railway station, located around 52 km away from here and is connected to the major cities of Maharashtra. By Road: One of the best ways to reach Panchgani is by road. The town offers excellent connectivity by roads and there are regular buses which operate from major cities to the hill station. The total driving distance from Mumbai to Panchgani is around 244 km. Best Time To Visit: Panchgani is a year around destination, however, the months from September to May are considered to be the best months to pay a visit to this hilly retreat. Route 1: Mumbai - Rasayani - Lonavala - Pimpri - Chinchwad - Pune - Khandala - Wai - Panchgani via Mumbai - Pune highway and NH 48. If one opts to travel through route 1, you can reach the place by driving a distance of 244 km which would take around 4 h 22 min from Mumbai. By route 2, it would take you around 5h 23 min to cover the total distance of 249 km via NH 66. The second largest city of Maharashtra and the cultural capital of the state, Pune, is home to a very vast history which takes you back in time to the period of the Peshawas to Gandhi and further back. Keeping the historic significance aside, the city is also known as the Oxford of the East due to the large number of educational institutions found here. Pune has its own share of heritage structures, such as the Shaniwar Wada, the Aga Khan Palace and the Pataleshwar Cave Temple. Being called the cultural capital of Maharashtra, the city has a pantheon of venues which hosts many prestigious music and dance festivals. The credit of discovering this land goes to the British, as they were constantly searching for the perfect place to escape the hot summers of India. The place was discovered by a British officer named John Chesson sometime during the 1860s, who later revamped the entire place and encouraged people from all walks of life to come and settle down here. The five hills which surround the place is topped by a volcanic plateau which is considered to be the second longest in Asia. This plateau is known as Table Land and is spread across a vast area of 100 odd acres which is gives it an appearance of a well-laid green carpet which is the major attraction here. Another major attraction as view point provides a bird's eye view of the Krishna valley along with the Dhom Dam, Kamalgad Fort and the city of Wai. The place gets its name from Sir Sydney Beckwith who was the Commander in Chief of the British Army. Standing tall with a lot of mysterious stories to narrate. Nobody knows the origins of the fort. The structure like other forts in the region was under the supervision of the Marathas and later fell into the hands of the British who used it to detain and execute war prisoners. The caves of Rajapuri is another major attraction according to legends. The Pandavas had taken shelter in its depths during their exile period. The caves also have many ponds, which supposedly get water from the Ganga and is, hence, considered holy. At Kate Point, one can see a huge rock which overlooks the Krishna valley, the Dhom Dam and Balakwadi. The Parsi Point, too offers brilliant views of the place, which makes it one of the photo points of the town. An UNESCO World Heritage Site, is known for its natural beauty and its wide variety of flora. The place has been declared a reserved forest which is filled with lakes, flowers and much more. The Kaas plateau is open to visitors only during the months right after the monsoon season which is during September and October. 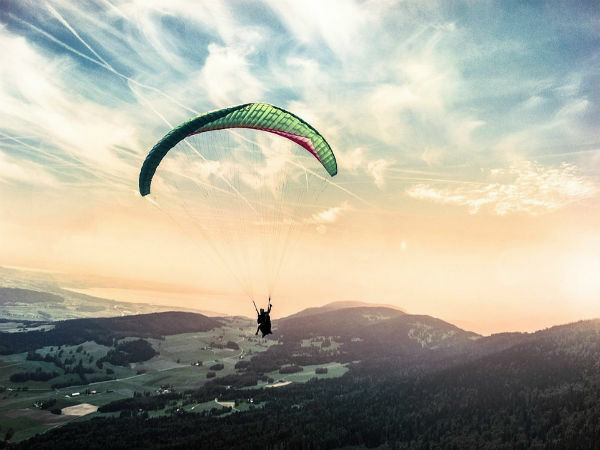 Panchgani is also considered as a hub for those interested in paragliding as the place offers brilliant views. One can find quite a large number of clubs here which offers this activity under the guidance of experts.